So, I am behind in posting again. Sorry! Last time I wrote we were at the Lazy Daze gathering in Quartzsite. Besides the organized dinners and happy hours, we had a great breakfast one morning. Everything was so good. I hadn’t done a breakfast potluck before – it was terrific! After the breakfast I had an appointment to get my furnace fixed. It blew hot air, but had a loud squeal. John and Roger knew a good guy that runs a mobile repair shop and he was parked nearby. 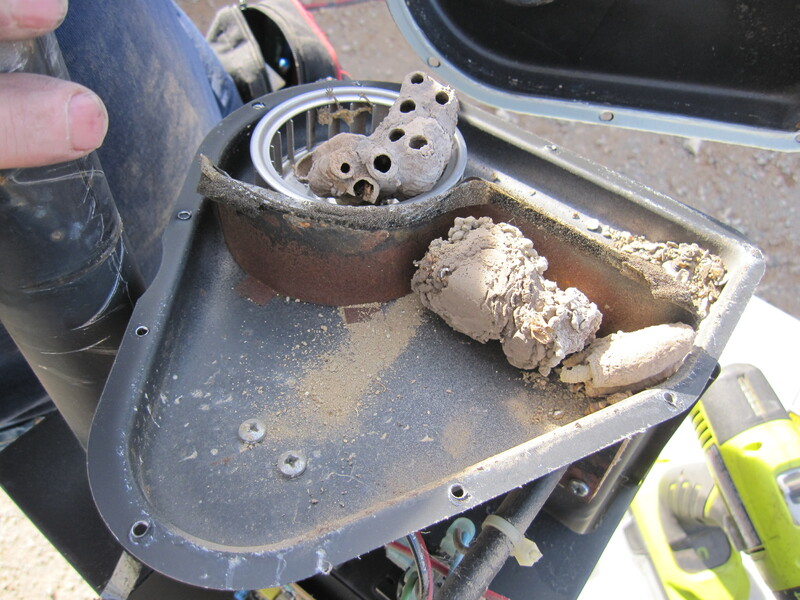 When he took the unit out we found a LOT of mud dauber nests in the pipes. I had put on mesh covers last spring to keep bugs out, but they must have been there from years before. It was a surprise the furnace was working at all! Before leaving Quartzsite Chris and I wanted to hike the mountain just west of our site. 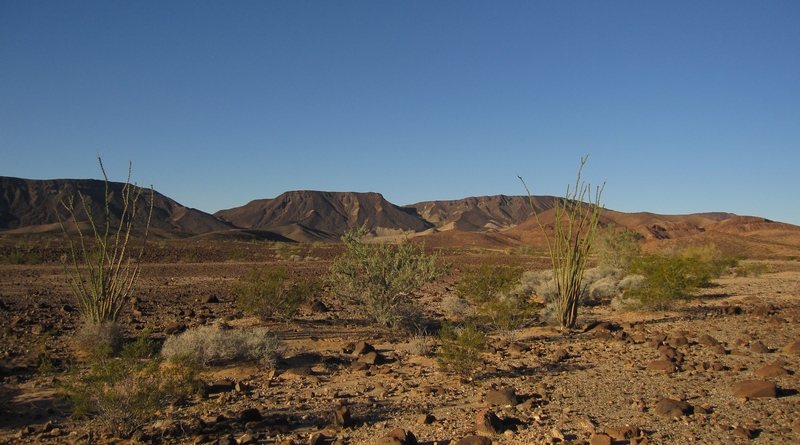 We had walked all over the nearby desert each morning, but hadn’t tackled that yet. It looked hard, but turned out to be not too bad. At the end of January everyone was gone or heading out. The 2 week LTVA passes were expiring and people had places to be. Melinda had gone to the Escapees Boot Camp. Roger headed to San Diego (then started an RV food blog). John and Linda to Prescott, then home to Colorado. Jim was going to Mesa to work at Spring Training. Andrea was going to an Escapees park to get the rig weighed, then to LA to visit family. It was sad to be parting from all the folks we had been hanging with for 2 weeks. Hopefully we will be able to meet up again in Albuquerque in October for the Balloon Fiesta. I was planning to go to Yuma to meet up with Randy, Laurie and others. They knew of a pretty BLM place on the water that would be warm for February. 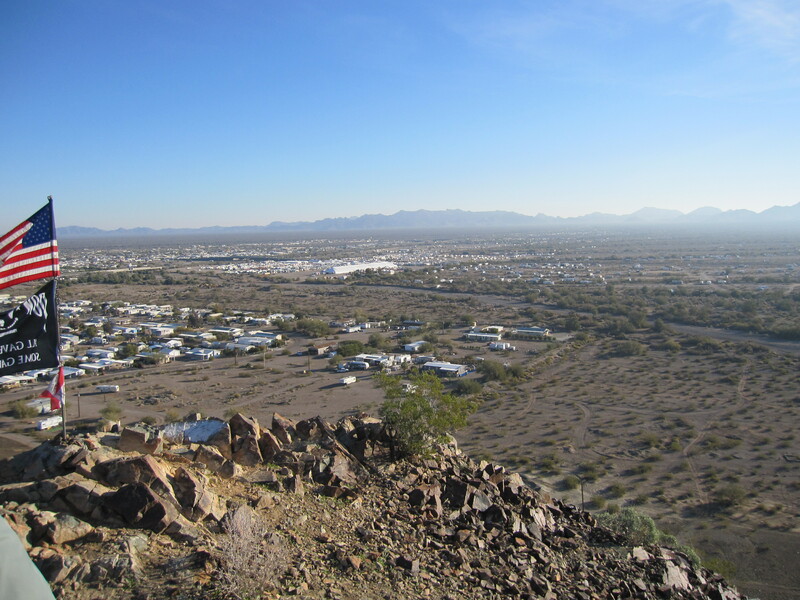 Chris was heading to Casa Grande for a solar installation, but came with to spend a few days on the way. We stopped at Imperial Dam, just north of Yuma. I wanted to check out Senator’s Wash and had one day left on my LTVA permit (good at all the sites around Quartzsite and Yuma). I really liked the surroundings. There were a LOT of people there, but we found a spot at the ‘Northwest Territory’ that was a little less populated. There was a hiking trail that started just across the street. On the 5th we arrived at the Paradise Casino where Randy and Laurie were parked, close to downtown Yuma. As soon as we got there we found out there was a Farmer’s Market in Downtown Yuma on Tuesdays, so we jumped in Chris’ truck and headed over. It was really good, but I forgot to take pictures. The next day we got to run some much needed errands, like going to a nice, big grocery store and doing laundry. 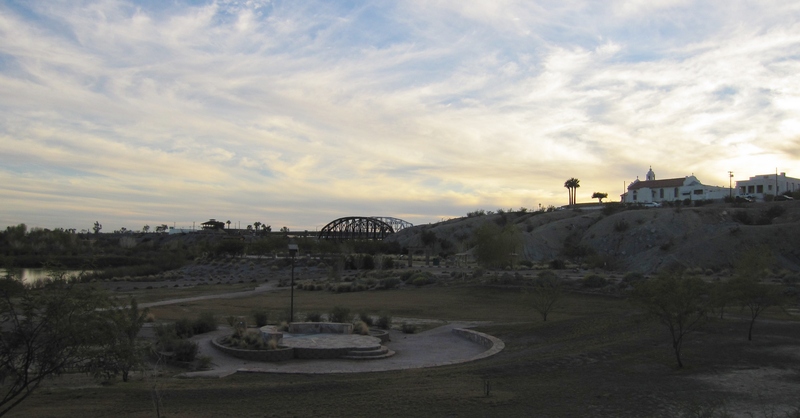 We checked out the immediate area, including the brand new park next door on the Colorado River. After a couple of days Chris and I were ready to go to the BLM site but Randy and Laurie were enjoying the benefits of close proximity to the city. So we headed on over there ourselves on the 8th. 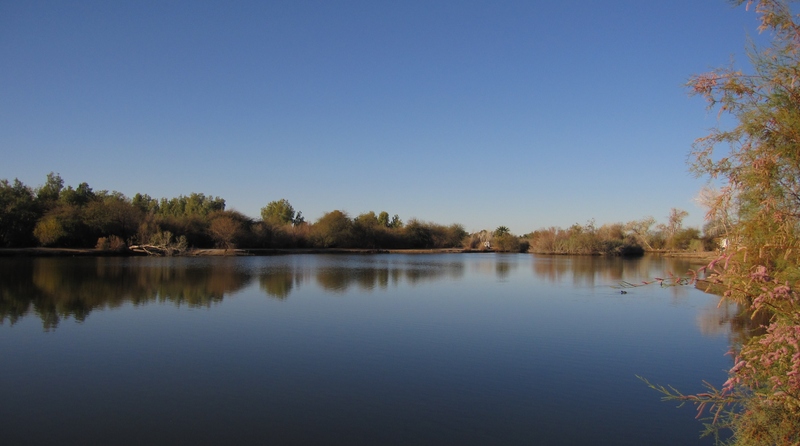 It’s a little spot in the middle of Yuma farmland called Fortuna Pond. Surprisingly pretty, but packed. We couldn’t find a spot along the shore that would fit both of us, but found a spot where we could park side by side. It was nice, but unfortunately no real hiking nearby. On the 13th Chris left for Casa Grande and I was heading west into California. 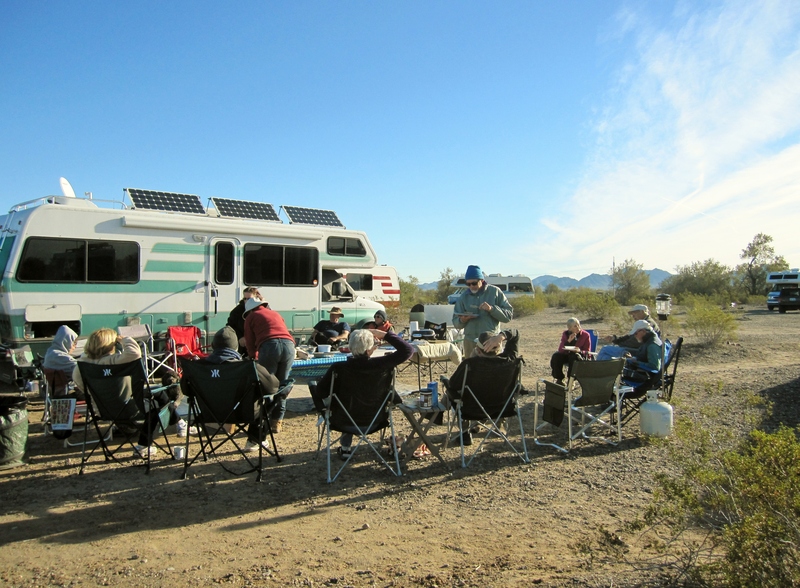 Bob Wells was staying just west of Yuma with some of the RTR folks. Since it was on the way to Anza-Borrego State Park I wanted to spend a few days with those guys. Will do a new post soon on California. This entry was posted in Arizona, Bureau of Land Management Campgrounds and tagged BLM Campgrounds, Fortuna Pond, Paradise Caino, Yuma. Arizona by ontheroadwithriley. Bookmark the permalink. As always it was great to hear of your adventures!! Hugs to both you and Riley! Hi Chris! Hope you are having a great time in Florida and enjoying your new rig. Hugs back at you and Edna! Thanks for the update. Sounds like you are lovin’ the life. Hi Kim! Definitely lovin’ the life. I sure enjoyed all of your trip reports. Hope to cross paths again down the road. Have a great time in California. You will notice a BIG difference in gas prices though. Keep us updated on your travels and hope to see you in Albuquerque at the Balloon Fiesta. Hi Jim! Yep, preparing for big gas bills. I filled up in Brawley for $3.99 yesterday, and that was the best in the area, so was glad to find it. Have fun at spring training! I would like to use your picture of the breakfast GTG at Q with my rig as the background for the Q Board. Hi Roger! Absolutely, you are welcome to use any of my Q pictures. You were a wonderful host/organizer, and I had a great time at the LD site!